From L: David Rudders, Dr. Bill DuPaul, and graduate student Noelle Yochum aboard a commercial scallop boat during a 2005 monitoring survey. Scallops are brought onto the deck of the F/V Celtic during a 2008 survey trip. Photo courtesy Shannah Jaburek/National Marine Fishery Service. Crew of Celtic Paul DeMarias, Captain, manages crew sorting scallops on the F/V Celtic during a 2008 survey trip. Photo by David Rudders/Virginia Institute of Marine Science. Researchers at the Virginia Institute of Marine Science (VIMS) will receive more than $1.75 million to study sea scallop populations in 4 areas along the East Coast, including New York Bight, where fishing vessels pulled in unusually large catches last year. The 4 areas are fished by vessels from throughout the region, including Virginia, where scallop landings have exceeded $60 million annually since 2007. “We were surprised by the volume of scallops harvested off the New York Bight,” says VIMS researcher David Rudders, who has studied scallop populations for more than 10 years and has recently been appointed to the research faculty at VIMS. Although the increase in harvest could result from a number of causes, Rudders suspects there may be a larger scallop population in the area than previously thought. Even at current effort levels, scallops continue to be one of the most successful East Coast fisheries. Scallops have been ranked as “not overfished” by the National Marine Fisheries Service for more than a decade. These healthy resource conditions have recently enabled scallops to become the most valuable single species landed in the U.S. and Virginia. Landings from Virginia-based vessels accounted for nearly 20 percent of the nation’s scallop landings in 2009, totaling $63 million ex-vessel, not including the money generated on land by processors, shippers, and others. This recent success is due, in part, to the scallop industry’s willingness to support research. Not only do industry vessels play host to researchers, as some Virginia vessels will in Rudders’ upcoming research, but industry also sets aside a portion of the scallop quota to fund surveys and other applied research. The data from these surveys have been used to determine fishing limits, reduce bycatch of finfish, and minimize habitat impacts. 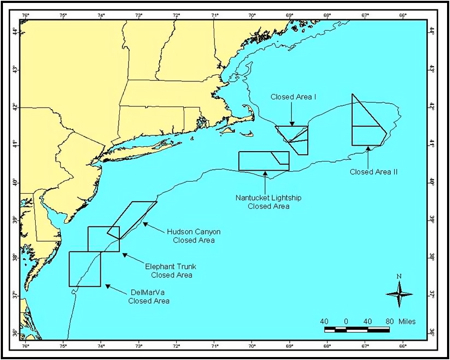 Starting in May, Rudders and William DuPaul, VIMS emeritus professor, will work with industry vessels to survey Closed Area II and Nantucket Lightship Closed Area on Georges Bank and the mid-Atlantic’s DelMarVa closed area. Researchers will also examine open areas of the New York Bight and Southern New England. This research is funded through the Sea Scallop Research Set-Aside Awards program, funded by the sea scallop industry and administered by the National Marine Fishery Service.